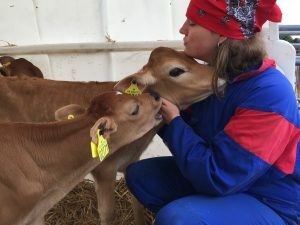 To cuddle calves or cows increases the contact between humans and animals and gives life-affirming joy. 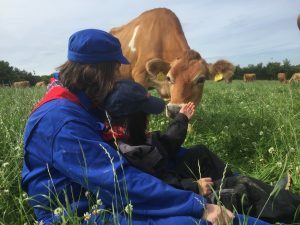 • that cuddlecows are healthier and give more milk? • that cows tell each other, that they like to get cuddled? • that cows absorb stress? • that the person who cuddles, will get back to being yourself? You don’t cuddle cows in your regular clothes. We provide you with an overall, a traditional red dutch scarf, a hat and rubber boots. By doing that, we get in the right mood and prevent you from getting your own clothes dirty. We start by going into the huts (calf nursery), to see the small calves, we just sit down and try to connect. As soon as we feel confident, we take the next step. We’ll go out to the field where our dairy cows are munching on the succulent grass, they are working on producing the delicious milk. Jellemien is by your side all the time and ensures a safe and amazing experience. The experience takes around 2 hours and can be in connect with – eg. field hiking, berry picking, barbecue arrangement, coffee & cake, ice cream-eating or pancake baking etc.